Surfing is a big part of the culture in Santa Teresa Costa Rica. Mal Pais beach it is a great place to learn to SUP, or improve your SUP skills. 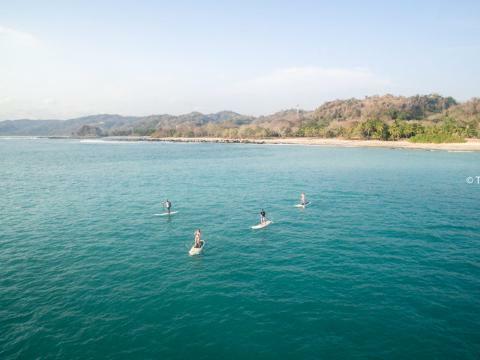 Not only do we teach you all the skills to SUP, we also teach you ocean awareness, environmental awareness, basic pre-SUP stretching exercises and, most importantly, safety. All of your equipment will be supplied unless you prefer to bring your own. Please note that lesson times may vary depending on wind and tide conditions. Conditions are good to give SUP lessons on most days in Santa Teresa Costa Rica. If conditions are not acceptable for lessons in one area they are often fine for lessons at another near-by break. At the time of your lesson you will likely be asked to meet your instructor at Selina. At the designated time You will meet your instructor and your equipment will be selected for you and prepared for your lesson.